The Hudson Flea in Hudson, Ohio is an upscale vintage flea market that draws hundreds from Northeast Ohio for a day of browsing and shopping. From May to September, the last Saturday of the month at the Elevator Works features an open air market, food trucks, furniture, jewelry and more. Adding to the draw, the Evaporator Works is a registered historic private property that once spawned a now-famous invention (the evaporator that makes maple syrup from sap!). 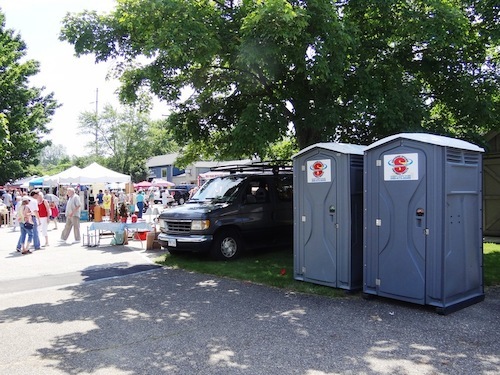 With all the foot traffic, shoppers, families and vendors at this busy outdoor market, it was important to organizers to provide clean, well-maintained and easily accessible portable restroom facilities. We worked with organizers before this regular summer event to determine how many units would be needed based on projected attendance. We dropped off the units before the first flea in May, and pumped and maintained each unit before and after each subsequent event. We take pride in doing our part to help these fun and unique Northeast Ohio events run smoothly. For more information on portable restrooms for your next event, contact the Superior Portables experts today!